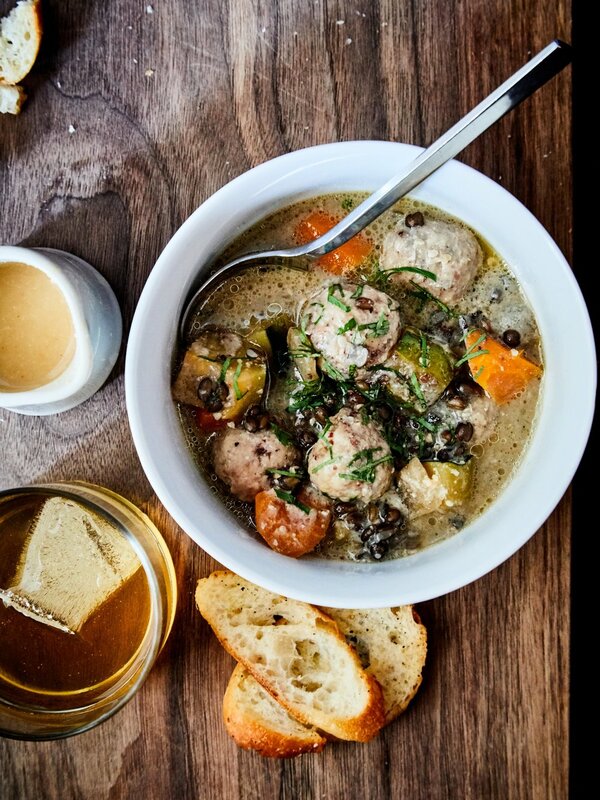 Scandinavian-inspired Meatball Soup is what you should be eating right now. This soup is my twist on Swedish Meatballs meets Italian Wedding Soup, it’s brothy (and if I’m feeling like it, sometimes creamy) with meatballs that I also use in my Swedish Meatball recipe. This is a great dinner party soup, you can make it ahead of time, assemble/heat while your guests are hanging, and you don’t have to miss any of the fun because you’re stuck in the kitchen. Serve with crusty bread. Throw some mashed potatoes on top if you really want a hearty stick-to-your-bones dish. Kids and adults love it. I love it. And I think you’ll love it. Combine the barley, salt, and 2 ½ cups water in a small pot. Bring to boil over medium-high heat, then reduce to a simmer. Simmer the barley until the water has all either been absorbed into the barley or evaporated. Cool the barley in a thin layer on a sheet tray. Meanwhile, while the barley cooks and cools, caramelize the onion, cooking it over low heat. Add the water, dried shitakes, and beef bones. Increase the heat to medium-high and simmer for about 10 minutes, or until the broth has reduced by about 1 qt. Skim the top of the broth from time to time. Remove the bones and set aside. Add the meatballs and barley, simmering for at least ten minutes before serving. The soup can then be served immediately, or you can take it off the heat, refrigerate, and reheat to serve the next day. Add the panko breadcrumbs and milk to a mixing bowl. Mix briefly and allow to sit for a minute. You want the milk to hydrate the breadcrumbs until they’re porridge-like. Combine the pork, veal, egg, and panko mixture into the bowl of a stand mixer. Mix on slow speed until fully incorporated. Then add the cheese, nutmeg, pepper, and salt. Turn mixer off and scrape the sides. Run the mixer on medium for one minute. Portion the meatballs on a greased or lined baking sheet. We like large tablespoon sized meatballs, placed about an inch apart. Scoop the meatballs out with a spoon and form gently by hand. Cook at 350F for 15 minutes, or a bit longer if you make larger meatballs. You can find lots of other killer recipes like this in my first book, Northern Hospitality.